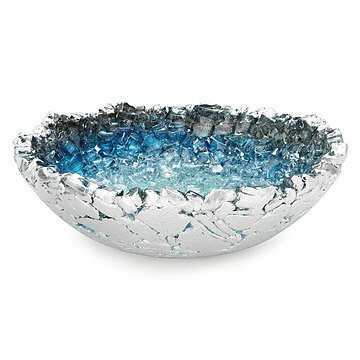 This exquisite bowl of reclaimed glass and silver is the product of a painstaking process. This richly textured vessel is a treasure of kiln-formed glass adorned with radiant silver-toned leaf. Each piece is the product of a two week, multi-step process in which artist Mira Woodworth collects upcycled glass fragments and uses the annealing process to apply a vibrant layer of silver-toned leaf to the exterior. Because she uses reclaimed glass, the surface of each piece will vary through dramatic undulations and small voids that celebrate the rich interplay of materials. These dynamically decorative bowls make dramatic centerpieces and decor focal points with an in-depth origin story. Handmade in Sacramento, California.